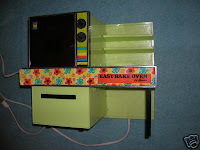 Aw, who didn't love their Easy-Bake Oven? Salon has an article about why the iconic toy is so beloved, and has been for decades. They also have a slideshow of the different models. I think I inherited mine from one of my sisters. It was yellow, I think, but none of the ones in the slideshow immediately ring a bell with me. Maybe #5? Or #6 but in yellow? When they started making them as microwaves, though, that was just not cool. Did you have an Easy-Bake Oven? What do you remember about it? I did not have one, but my cousin did. She was the next to youngest of 8 kids, and she and her younger brother were famous for getting up at 3 or 4 a.m. to open their Christmas presents. She did on Christmas Day, and was so excited, that she decided to make a cake right away. Problem was, she didn't know how to use it, so instead of plugging it in, she put it in the real oven, turned it on to high, and the family woke up to burnt plastic fumes and smoke. Everyone was fine, thank goodness, but we've been making fun of her ever since, 30+ years later. I never had one, but I always wanted (and unsuccessfully begged) for one. I'm turning 30 this year and I STILL want one. Maybe someone will get me one as a wedding present! Is it proper to register at Toys R Us?